I had a fabulous appointment, one of the best I’ve ever had anywhere. The spa was clean and the staff was awesome. I’m only sorry I didn’t get their names. The esthetician who shaped and dyed my eyebrows did a first-rate job. They have never looked so good. And my pedicure was impeccable, and I am a fussy person. I am from Canada and knew nobody there so when I say I don’t “get” the negative reviews you can be assured of what I say. I had a wonderful experience from start to finish. I was vacationing in HHI and wanted some spa services. 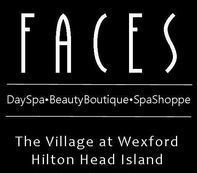 Faces had many good 5* reviews and a few unhappy customers. I want to say that the 5* was right on. I was greeted when I entered, service began promptly. I had a pedicure, the monthly special. It was relaxing and done to perfection. My nail tech was obviously super-experienced and it showed&#10084;&#65039;Thank you so much. Then I had my eyebrows shaped and dyed. What a marvellous job! The esthetician was so careful and took the time to shape my brows so that they were perfect for my face. I am a redhead and was worried about the colour the dye might make my brows. Too dark?? But no, the colour was awesome. I was amazed what a difference a pro can make. I’m sorry I did not get her name to thank her publicly. &#128536; The next time I am in the area the first thing I’ll do is make an appointment at Faces. One of the most wonderful facials I've ever had. Never had a more relaxing experience. My face and my spirit came away totally renewed. Wonderful spa atmosphere. Very knowledgable staff Best facial ! Jody gave me a wonderful facial and the whole staff made me feel welcome.